The new Roland 3D printer! 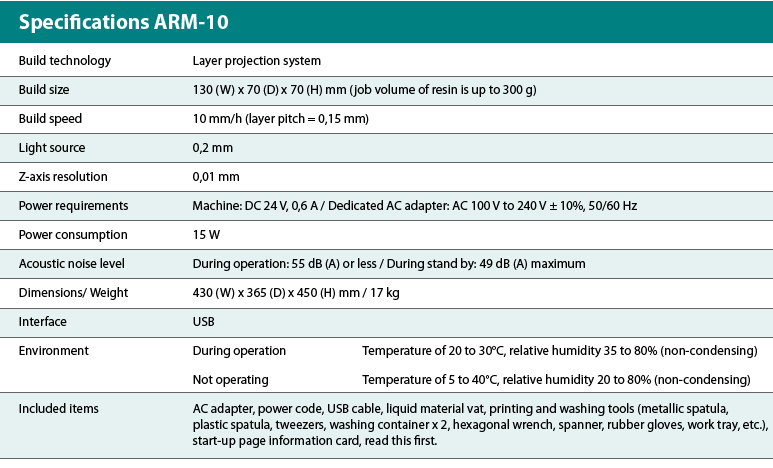 The ARM-10 incorporates a stereo-lithography process with a UV-LED projection system to build models by sequentially curing layers of resin from a liquid resin vat. The usage of this device is suitable for quickly checking a design in the initial stage of prototyping or modelling a complex shape since the final results high quality. With 3D printing, parts which previously required multi-axis milling, such ascomplex objects with undercuts, can be built quickly and easily. By using asuspended build system, resin consumption is kept to a minimum, making model production efficient and affordable. 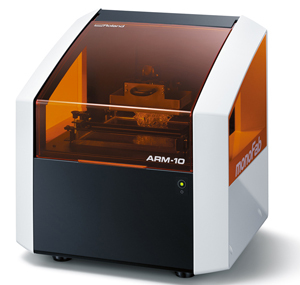 The ARM-10 allows the simultaneous production of multiple objects within the same work area. In this way, the modelling time is reduced in comparison with other methods where lasers expose specific areas. Moreover, Roland’s imageCure® simplifies post-processing proceduressuch as support* removal and polishing, becoming semi-transparent when cured by UV light. 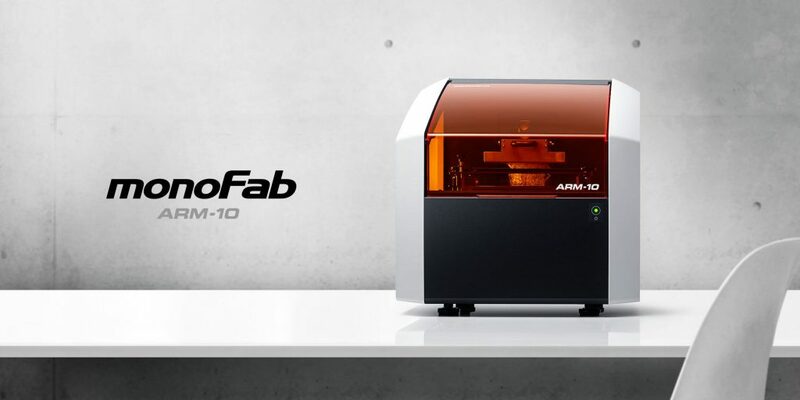 The ARM-10 is the first desktop 3D printer developed by Roland DG. It features a proprietary projector lens and Roland’s imageCure®, creating 3D models using UV light. 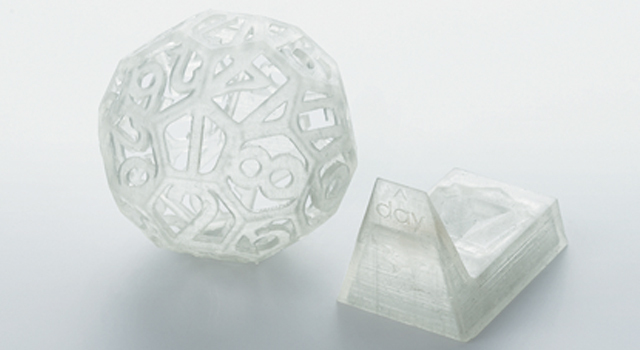 The UV lamp instantly cures and laminates acrylic resin layer by layer to build 3D shapes. The projection system allows simultaneous production of multiple objectswithin the same work area, enabling efficient 3D printing. The resin becomes semi-transparent when cured and post-processing, such as support removal as well as polishing and adding color are simple to do. 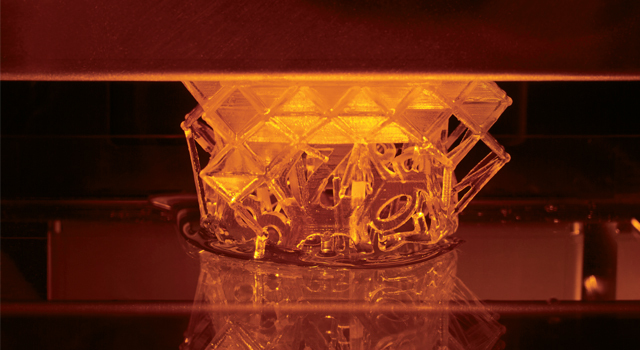 The new Roland 3D printer is an Additive Rapid Prototyping (ARP) device. This technology is suitable for making functional models, components,mock-up, artistic products as well as design objects and other applications. monoFab Player AM enables data correction, with a healing function to fill in any gaps in 3D data and simplification of meshes, layout editing and automatic support generation. The user-friendly interface is easy to use, making it ideal even for beginners.